Das frische, traditionelle mild-süffige Premium Pils. Unterirdisch wässriges Vorzeigepilsener der good old school of German Untergär. Pfui!!! 0,5l Gift  from Cottbus. Assaggio: fusto da 5L scadenza 4 mesi. Prodotto molto naturale e fresco con buona maltatura abbastanza leggera ma persistente. Luppolo molto presente, lievemente floreale e con retrogusto piacevole e lungo. Bevuta alla spina un’ottima pilsner. 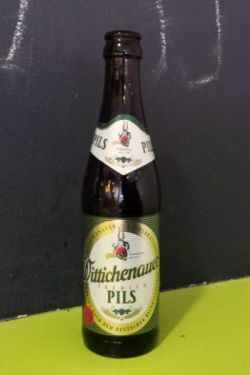 Bottle.Clear straw,thick head that disappears quickly,some lacing.Aroma malty,slightly skunky,a little sulphur.Taste malty,full,a bit sour.Carbonation lower than expected,bitterness likewise.Aftertaste bready,malty.Another German pilsner,nothing to it. Bottle 0.33 l, Sztrass Burger, Wrocław, Poland. Złote piwo z puszystą ale niezbyt obfitą pianą oraz słodowym zapachem. W smaku pełne z wyrazistą goryczką na finiszu. Pale blond color, hazy. Light cereals and straws aroma. Light cereals flavor, correct bitterness. Bottle looks good, reminds me of Freiberger. Beer in the glass zippy, nice head. Starts modest dry, spicy, more and more grasy-fresh. Metallically background. Nice pilsener! Bottled. Clear pale golden, rich head. Sweet and fruity, medium bodied with rounded mouthfeel. Very loght spicy hops, some surprising vanilla and grain. Fairly low bitterness. Not very pilsnerish. It is golden with a white head. The aroma has notes of straw, grass and malt. The flavour has a light sweetness, notes of malt, straw and light butterscotch. It is smooth, refreshing and pleasant to drink.